In honour of National Smile Power day which is today I thought I would talk about smiling! When I am out and about you’ll usually see me with a ridiculous full-on smile. I’ll be walking down the street or through the grocery store just grinning away. Smiling has become a habit of mine.. a really great one! I tend to smile at pretty much everyone I encounter and it doesn’t matter whether you’re young, old, small, big, mean looking, or also smiling... you’ll get a smile from me. And you know what? I really hope it brightens your day. I’ve heard multiple times “you’re the nicest person I know” or “your positivity is rubbing off on me... I needed that”. This is what I want!! I want to pass on my happiness.. I want to pay it forward! I want the people I smile at to smile at others and brighten others days. You know what a few of the best things about smiling are? A smile is naturally beautiful and they’re free to give away! They NEVER go out of style and can be one of the best accessories anybody can have! ONE smile given to ONE person can affect their next actions and can actually alter their day and sometimes even their life. Imagine if you directly impacted someone’s bad/horrible day by just flashing them one genuine smile? That’s a feel good moment right there. A smile can start to mend walls, can welcome conversation and can even bring new, positive individuals into your life. 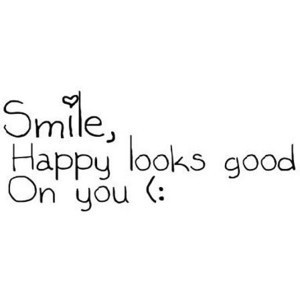 A smile can also demonstrate open body language and can show your sincerity. Choosing to smile instead of frown not only does something for others.. it does something positive for yourself as well. By choosing to smile you are directly affecting the way you feel, the choices you make, and it will improve your outlook. It also boosts your immune system, lowers your blood pressure, releases endorphins, natural pain killers and serotonin. A smile can also reduce your personal stress after a stressful situation. This is called the facial feedback hypothesis. Forcing a smile is enough to lift our mood.. even if it is just slightly. So in conclusion, what are some of the after affects? You will be inspired to continue treating others with kindness and compassion, will brighten others days, will radiate positivity and you can majorly change someones day. It also greatly affects your own day in particular the way you feel, choices you make and your stress levels. Plus they’re free and contagious! So give them out!